The Blue Bomber returns in a proper modern sequel, but the new Double Gear system may have longtime series fans running for the hills. It's been quite a while since video game fans were treated to a proper Mega Man release. Capcom's iconic robo-hero has been rocking around for 30 years, and most of his adventures — even the newer ones — have relied on gameplay design that was showing signs of age before many of today's gamers were even born. Put simply, the Blue Bomber was in desperate need of a makeover, and Mega Man 11 aims to make that happen through a new visual style and some fresh gameplay tweaks. By and large, the new formula works well, but there are a few flies in the ointment that prevent Capcom's latest release from stacking up to the classic titles that came before it. Most video game fans are likely already aware of how Mega Man games function: the Blue Bomber himself can move left or right, jump, slide, and perform both normal and charged Mega Buster attacks. Levels are littered with environmental obstacles, perilous jumps over bottomless pits, and enemies that are all-too-fond of swooping in at inopportune moments. 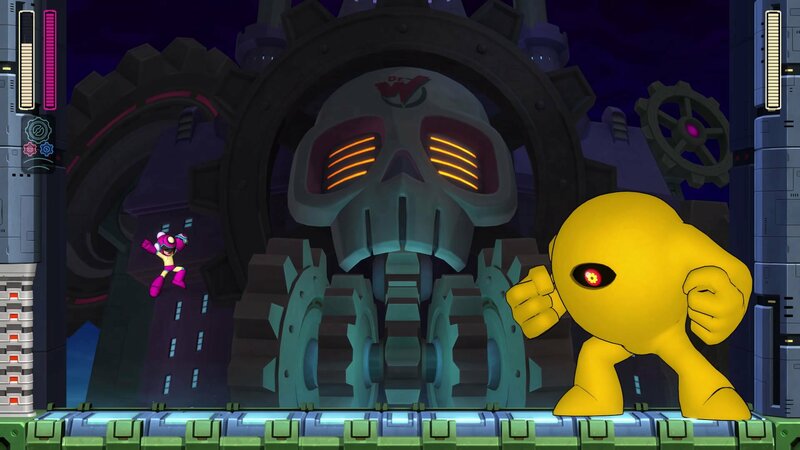 Reaching the end of a level means facing off against a Robot Master, and conquering the foe unlocks its power for later use. 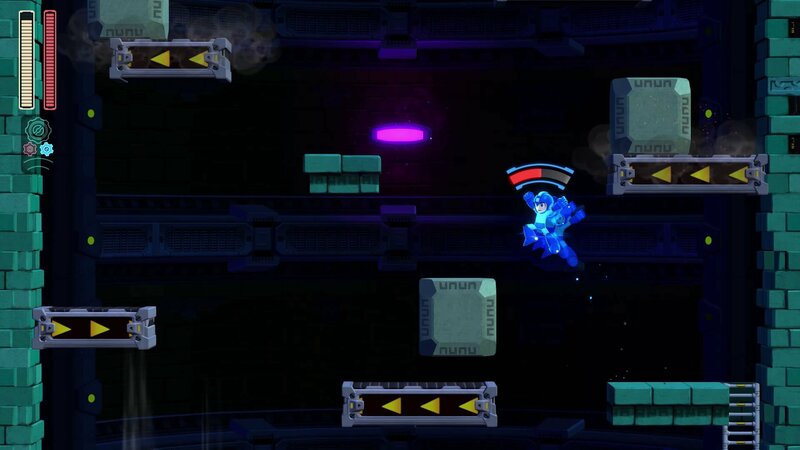 In this sense, Mega Man 11 feels and plays in the same way that the series has for three decades now — like a combination shooter/platformer that demands both memorization of levels and precisely timed shots and jumps. The Speed Gear makes for interesting new platforming challenges. While the central action sticks to this familiar recipe, the addition of the new Double Gear system drastically changes the way the game is actually played. By triggering either the Power Gear or the Speed Gear, Mega can gain a tremendous boost to his attack power or his movement speed, respectively. The Power Gear is great for taking down bosses or minibosses quickly, while the Speed Gear is most often used to navigate perilous traps or rooms swarming with enemies. The interplay of these two Gears is at the heart of Mega Man 11's gameplay. While it may be possible to beat the game without using either, most levels have areas or enemies that are explicitly designed to be conquered through use of one or both Gears. And while the Power Gear may often be reserved simply for taking out Robot Masters, the Speed Gear is indispensable for conquering some of the game's numerous challenges. Mega Man titles are typically known for being challenging, and Mega Man 11 is no different. This game definitely requires precise platforming and a high degree of situational awareness; however, considering that most of the new game's levels were designed with the powers of the Gear system in mind, even seasoned Mega Man veterans like myself should be prepared for some frustrating moments. Considering that MM11 is technically a new entry to the original series, it feels odd to say that it's very much unlike its predecessors. The Gears system fundamentally changes how challenges should be approached, and yet the presentation feels roughly the same as it ever has. The result is that series fans will probably tend to approach enemies and obstacles as they always have, without necessarily being aware that they can deploy the Power or Speed Gears at will. Series fans can expect to see a few familiar enemies. This juxtaposition of old and new makes for some especially difficult segments, specifically in the areas where use of the Speed Gear is essentially mandatory. Matters only get worse in a few specific levels, Bounce Man's level in particular, where it feels like the player has very little control over Mega Man without use of the Speed Gear. The Speed Gear ultimately becomes such an indispensable utility that players may wind up keeping it activated as often as possible, at which point they may be left wondering why the slowdown mechanic was included at all. Along with the new Double Gear mechanic, Capcom has decided to give Mega Man 11 a proper modern makeover. As opposed to the distinct 8-bit stylings of previous series entries, Mega Man 11 is presented in a crisp 2.5D take that sees 3D models planted over 2D backdrops. The styling may not be for everyone — it turned me off at first — but it does fit well into the gameplay, and 3D effects makes special abilities and boss attacks really pop. Backgrounds offer just the right amount of detail, and small touches to character animations make cutscenes all the more entertaining to watch. The push for a more modern design also crops up in each of the game's 8 different levels. Familiar scenes like slippery wintry environments and electrically charged industrial zones are still present here, but it's clear the developers put effort into making sure each area felt fresh and unique. 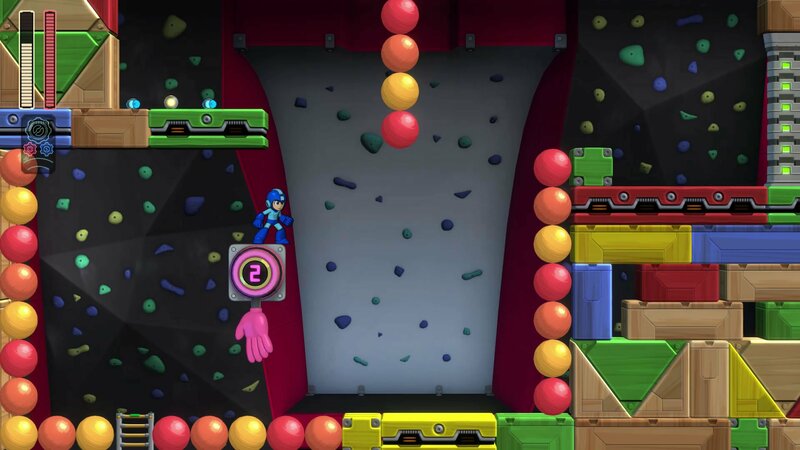 Bounce Man's level is again noteworthy in this regard: not only is the bulk of the level lined with bouncy balls that ricochet Mega Man all around the environment, it's also noteworthy for being downright fiendish. This level definitely doesn't feel like something series fans would expect, and perhaps that's why I found it to be the single most frustrating component of the entire game. Bounce Man's level is among Mega Man 11's most intense challenges. Mega Man 11 also contains a level of polish that helps it keep pace with the recently released Mega Man and Mega Man X Collections. Menus are crisp, the music hits a pleasing retro vibe without resorting to chiptune-esque loops, and there are extra goodies and unlockables all over. Players can also collect Bolts in order to purchase various parts that make gameplay much easier, such as by decreasing the Double Gear cooldown time or automatically charging Mega Buster shots. Of all the extra features to be found in the game, such as the Gallery mode or the multitude of various Challenge modes, by far the most important is feature the option to change the difficulty. The standard Normal difficulty might seem like a good place for most players to start, but trust me, it isn't. This game is hard, and since so much of the action requires memorization of environmental obstacles and enemy placement, making an initial run on the Casual or even the Newcomer difficulty is strongly advised. Change can be scary, but it's often a necessity. Capcom's mechanical hero has been fighting the good fight for 30 years, and while many of us may want him to stay the same forever, to do so would ultimately consign his adventures to the history books. Mega Man 11 manages to bring our favorite Blue Bomber back into the modern conversation, and the Double Gear system helps tweak the familiar formula into something that feels fresh even in 2018. 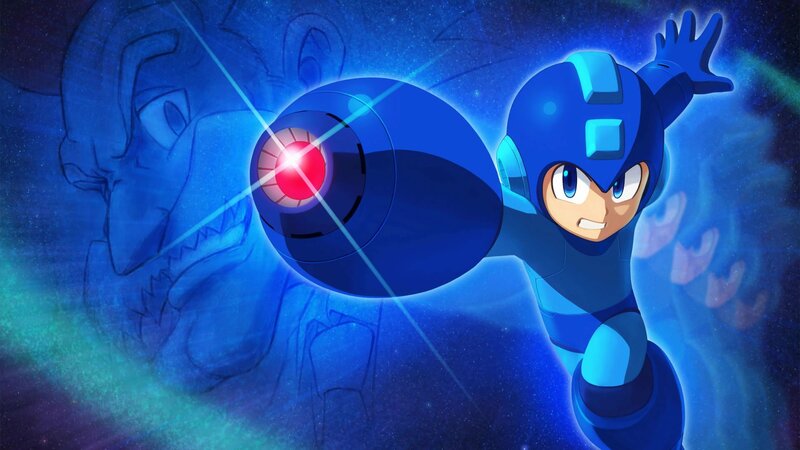 It may not be the smoothest transition — purists may shun the new mechanics, while unfamiliar players may wonder how the game was ever interesting without them — but the bottom line is that Capcom has found a way to keep Mega Man alive without banking solely on retro gaming nostalgia. This review is based on a PlayStation 4 download code provided by the publisher. Mega Man 11 will be available in retail and digital storefronts on October 2 for $29.99. The game has been rated E for Everyone 10+ by the ESRB.